“The Book of Life,” is a collection of letters "from the living to the dead," written by widows, orphans and perpetrators to their lost loved ones and to their victims. The idea for the project came to artist Odile Katese as she witnessed the pain Rwandans were experiencing recounting memories of those who had been killed. It prompted her to find a way to revisit the genocide “in a more peaceful way because we have to make peace with our history.” Artist Odile Katese was in exile at the time. Despite being far from the killing, she was not immune to the deadly events and their repercussions. Returning three years later, she barely recognized her country. 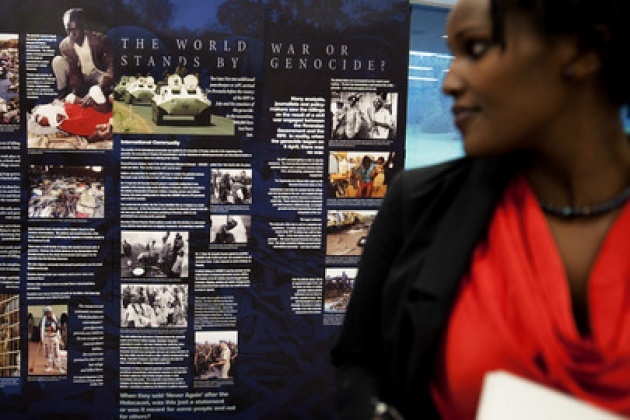 Seeking to “balance the testimonies,” the project aims to create a more serene and peaceful space from which Rwandans can revisit and process the genocide, so that they can move forward, the artist said. It seeks to put a more “human face” on the lengthy list of names traditionally read aloud each year during genocide commemorative ceremonies, and strives to commemorate the victims’ lives, rather than their deaths. The letters often recount how the lost ones laughed and brought joy to life. Ms. Katese said she hopes the “Book of Life” project will continue to grow, extending to generations beyond and across borders “so that my kid and the next generation will find the testimonies of the survivors, stories of perpetrators, and they will find also that we continued to think about them and even our kids can write to them if they want.” She envisions setting up a space where people can write to the victims, remembering them and their lives, and having people from 100 countries write 100 letters on how they are affected by the genocide and having the collection bound into a school manual for all to learn from.